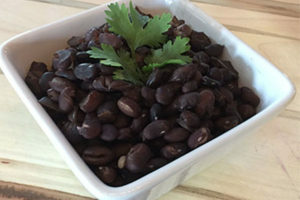 Making your own black beans doesn’t need to take all day! In fact, this recipe will show you how to take your beans from dried to tender and delicious in under 1 hour! It is a common fact that everyone knows that dried beans cost significantly less than canned beans. So why doesn’t everyone reach for the bag of dried beans when they go to the grocery store? Time! 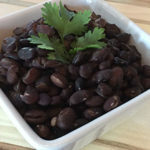 If you read the instructions on the package of black beans, it will tell you that you need to soak your beans overnight, and then simmer them on the stove for 1-2 hours. Even with the quick soak method, you are spending hours to make your own beans. Who has time for that? That is where the Instant Pot (pressure cooker) comes in. No need to soak your beans. No, really, you don’t even have to quick soak them. Just add the dry beans to the pot with the other ingredients and in less than an hour, you have tender and delicious black beans! Take dried black beans to tender, seasoned and delicious in under 1 hour. Discard chipotle pepper and bay leaf. Stir and serve.